As all vegetable oils and fats, Palm stearin is a triglyceride (a glycerol backbone linked to three fatty acids by ester bonds). 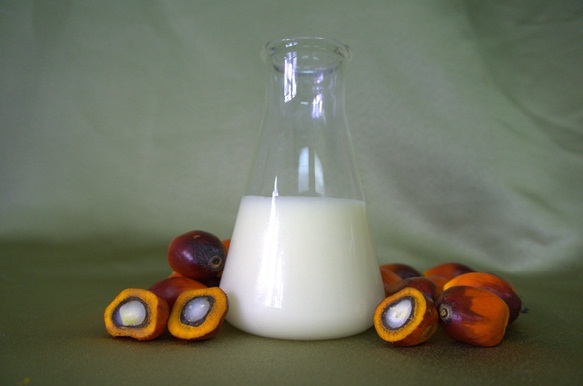 Palm stearin is characterized by a high proportion of palmitic acid (50-68%) and oleic acid (20-35%). Other fatty acids presented in significant amounts are: linoleic acid (5-9%), stearic acid (4-6%) and myristic acid (1-2%). It is obtained from oil palm (Elaeis guineensis), after a process of refining, bleaching and deodorizing, resulting in a palm oil known as RBD (Refined, Bleached and Deodorised). After this process it is subjected to a fractionation at low temperature, its crystallization and subsequent filtration. The solid, palmitic acid rich fraction is known as palm stearin, while the liquid part is palm olein (rich in oleic acid). It is a solid substance between white to pale yellow at room temperature. Its melting range is between 47º-54ºC. Among its many applications, as the vast majority of fats, it emphasizes human consumption. They are an important source of energy, due to its high performance in calories metabolized per gram. Its most important use is in the kitchen, especially as oil for frying or grilling. Other important applications lie in the field of oleochemical and in almost all known industries, from cosmetics to animal feed, although its derivatives are also used as alternative fuel oils (biodiesel), soaps, lubricants, surfactants, advanced detergents, paints dyes, insecticides, soaps, veterinary. The product can be presented in 850 kg. containers or bulk tank.